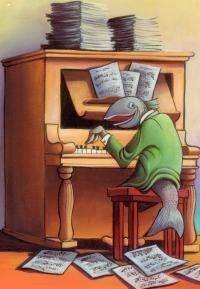 Q: What do fish play on the piano? Q: Some will use me, while others will not, some have remembered, while others forgot. For profit or gain, I`m used expertly, I`m not picked off the ground or tossed into the sea. Only gained from patience and time, can you unravel my rhyme?